Whitney, Phyllis Ayame. (1964). Sea Jade. Fawcett Publications Inc.; Connecticut. As mentioned earlier this week, I have a weakness for gothic romances and often yearn for nothing more than to retreat to a quiet place to gorge myself on the world of mystery, suspense, and intrigue that they offer. Phyllis A. Whitney, dubbed “The Queen of the American Gothic” novel, is an excellent author to initiate the newbie into this rich vein of fiction (Wikipedia article). Phyllis wrote over 70 novels over the course of her long life (she lived to be 104 years of age), and many of them involved some element of the exotic (Wikipedia article). 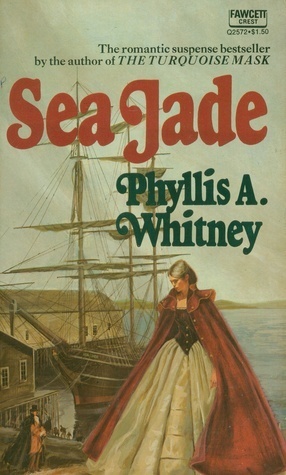 Born and raised in Japan to American parents, Phyllis remained fascinated by Asian cultures and this influenced many of her written works (About Phyllis A. Whitney, 2010). Photo credit to Fawcett Publications Inc., 1964. Sea Jade thus involves the classic elements of a gothic romance – including a young and impoverished heroine forced into a loveless marriage with a dark, brooding hero – with a heavy influence from the Orient. Those with an interest in nautical themes will enjoy the references to ships and early navigational activities throughout the book. Unfortunately, as with many in the gothic genre, there are parts of this book that lack any sort of action. Children and the proper raising of children is another somewhat tedious focal point for the story. These sections must be skimmed over and the remainder of the book will please.